Lee Thomas sealed Southam's win over Heather St Johns with a goal in injury time. After missing a host of chances, Southam finally overcame Heather St Johns with two late goals to get back on the winning trail after their heavy midweek defeat, writes David Hucker. Heather are managed by former Saints boss Lee Knibbs, who has recruited a number of his former squad to St John’s Park, including prolific striker Simeon Smith. The first scoring chance fell to Saints in just the second minute when Lee Thomas and Mark Bellingham combined to set up Louis Bridges but, with the goal at his mercy, he pulled his shot wide. At the other end, Tom Cooper was on hand to block a shot from Danny Gordon before Saints cut the visitors’ defence apart down the right, but Thomas put his cross too close to keeper Scott Handley. Thomas then put another effort wide before Connoll Farrell cut inside but nobody could get on the end of his cross. Thomas went close again, chipping over the advancing Handley, but the ball drifted just wide of the post. Bellingham then shot straight at the keeper before a Bridges effort in the 35th minute hit the post. As the interval approached, a flurry of activity from Heather saw Maksym Kowal send a long-range effort well wide and Gordon put a free-kick from the edge of the area into the defensive wall. Joe Williams came on at the start of the second half for Saints, replacing the injured Cooper with captain Myles Jones dropping back into defence. Bridges and Bellingham both shot wide as Saints continued to squander their chances before Leigh Phillips put a free-kick over for Heather. Bridges was off target with another Saints free-kick before Bellingham again shot straight at Handley. Kowal headed over from a Tom Muldoon cross and Sam Harris made a good blocking tackle. More chances fell Saints’ way with Thomas and Tunde Ajibade both going close. But, just as the match looked like ending in stalemate, Farrell swept the ball in from a corner and, in added time, Bridges set up Thomas who rounded Handley to make sure of the points. The result made it six wins out of seven for Saints who now face neighbours Racing Club Warwick on Saturday. 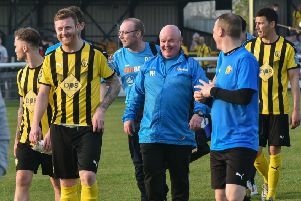  A Jamie Corrigan double gave Racing Club Warwick a 2-0 win at Nuneaton Griff to seal their first Midland League Division One success since September. Racers were the better side in the first half, but failed to turn their superiority into goals before a much more balanced second period. With 82 minutes on the clock, Corrigan opened the scoring with a fine effort from 20 yards. He then pounced to seal the points, shooting home after Jelson’s initial effort had been parried.